Due to our continued growth, Pete’s Tire Barns has many employment opportunities available. At Pete’s Tire Barns, we offer an excellent compensation package including competitive wages, overtime company sponsored health and dental insurance, matching 401k retirement, company paid STD and life insurance, employee discounts, safety incentives, paid holidays, sick and vacation. All positions require a good driving record and background check. All Applicants being considered for employment must pass a company paid pre-employment background check and physical and drug-screen. Assistant Store Manager – Amherst, NH: Apply online. Commercial Tire Technician – Woburn, MA: Responsible for performing general tire maintenance including tire repair, tire rotation and wheel balancing, tire mounting/dismounting mostly commercial tires but may also include passenger, light truck, loader, farm, ATV and/or lawn and garden. This position will provide on-call service and emergency road service to customers. Apply in person at Pete’s Tire Barns, 280 Mishawum Road, Woburn, MA or Apply online. Please include a copy of current drivers license. Tire Technician – Westborough, MA: Responsible for performing general tire maintenance including tire repair, tire rotation and wheel balancing, tire mounting/dismounting mostly commercial tires but may also include passenger, light truck, loader, farm, ATV and/or lawn and garden and may provide on-call service to customers. Apply in person at Pete’s Tire Barns, 150 Smith Parkway, Westborough, MA or Apply online. Please include a copy of current drivers license. Tire Technician – WRJ, VT: Responsible for performing general tire maintenance including tire repair, tire rotation and wheel balancing, tire mounting/dismounting mostly commercial tires but may also include passenger, light truck, loader, farm, ATV and/or lawn and garden and may provide on-call service to customers. Apply in person at Pete’s Tire Barns, 1341 Route 14 WRJ, VT 05001 or Apply online. Please include a copy of current drivers license. or Apply online. Please include a copy of current drivers license. OTR Tire Technician – Waterbury, CT: Responsible for performing general tire maintenance including tire repair, tire rotation and tire mounting/dismounting of OTR tires. Must posses a valid CDL. Apply in person at Pete’s Tire Barns, 100 Captain Neville Drive, Waterbury, CT 06705 or Apply online. Please include a copy of current drivers license. Tire Technician – Gardner, MA: Responsible for performing general tire maintenance including tire repair, tire rotation and wheel balancing, tire mounting/dismounting mostly commercial tires but may also include passenger, light truck, loader, farm, ATV and/or lawn and garden and may provide on-call service to customers. Apply in person at Pete’s Tire Barns, 591 W. Broadway. Gardner, MA or Apply online. Please include a copy of current drivers license. Tire Technician – Shrewsbury, MA: Responsible for performing general tire maintenance including tire repair, tire rotation and wheel balancing, tire mounting/dismounting mostly commercial tires but may also include passenger, light truck, loader, farm, ATV and/or lawn and garden and may provide on-call service to customers. Apply in person at Pete’s Tire Barns,407 Hartford Turnpike. Shrewsbury, MA or Apply online. Please include a copy of current drivers license. Tire Retread Technician – Rutland, VT: We are currently seeking a Tire Retread Technician to become part of the Pete’s Tire Barns team in Rutland Vermont. Using Bandag Retreading Technology, you will retread truck tires for some of the largest fleets in New England. JOB SUMMARY : Perform repetitive work to inspect, buff, repair, build, heat, seal tires through operating machines to re-build tires from rubber components. This job description will encompass all duties associated with Initial Inspection, Shearographer, Buffer, Repair, Builder, Chamber, Extruders, and Final Inspection. Apply in person at Pete’s Tire Barns, 62 Randbury Rd, Rutland, VT or Apply online. Road Service Tire Technician – Franklin, CT: Responsible for performing general tire maintenance including tire repair, tire rotation and wheel balancing, tire mounting/dismounting mostly commercial tires but may also include passenger, light truck, loader, farm, ATV and/or lawn and garden and may provide on-call service to customers. Apply in person at Pete’s Tire Barns, 95 Route 32 , Franklin, CT 06254 or Apply online. Please include a copy of current drivers license. Road Service Tire Technician – Randolph, MA: Responsible for performing general tire maintenance including tire repair, tire rotation and wheel balancing, tire mounting/dismounting mostly commercial tires but may also include passenger, light truck, loader, farm, ATV and/or lawn and garden and may provide on-call service to customers. Apply in person at Pete’s Tire Barns, 85 York Ave,Randolph, MA 02368 or Apply online. Please include a copy of current drivers license. 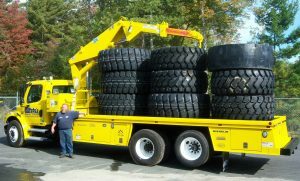 OTR Tire Technician – Westborough, MA: Responsible for performing general tire maintenance including tire repair, tire rotation and tire mounting/dismounting mostly OTR tires but may also include passenger, light truck, loader, farm, ATV and/or lawn and garden and may provide on-call service to customers. Apply in person at Pete’s Tire Barns, 50 Smith Parkway, Westborough, MA or Apply online. Please include a copy of current drivers license. Road Service Tire Technician – Woburn, MA: Responsible for performing general tire maintenance including tire repair, tire rotation and wheel balancing, tire mounting/dismounting mostly commercial tires but may also include passenger, light truck, loader, farm, ATV and/or lawn and garden and may provide on-call service to customers. Apply in person at Pete’s Tire Barns,80 Mishawum Road, Woburn, MA or Apply online. Please include a copy of current drivers license. Current TIA certification and previous Passenger and Commercial Tire experience a plus but not required. Company Orientation, OSHA required Safety and TIA training and certification will be provided. Commercial Sales: Servicing truck fleets throughout New England. Salary with commission to start with company vehicle provided. Front End Alignment/ Light Mechanical Service Technicians: Provide tire changes, light mechanical work, and alignments on our customers vehicles. TIA certification provided. Delivery / Route Drivers: Servicing all of our locations throughout New England on a daily basis from our “New Distribution Center” located in Orange, MA. Current CDL license required. Retread Technician: Perform all phases of tire retreading out of our Bandag Retread Facilities in Orange, MA and Rutland, VT.